How many km’s does it take to make a road trip? Does a trip to the corner shop make it a road trip or does it just make you lazy. Do you need to have a radio in your piece of crap car to make it a road trip? Do you need to have a bunch of friends bunched in the back harassing you as you drive? In my completely uneducated and unimportant view, a road trip can be whatever you want as long as you are in a good mood and ready to sing Bohemian Rhadsody at the top of your voice in the absence of said radio. 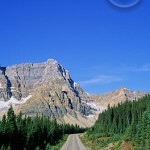 Stepping into my pink station wagon (not camp), I set myself up for the long 58km drive to beautiful Lake Louise. The not so long but winding road from Banff to Lake Louise. There are heaps of places to stop in between these two gems including Sunshine Village and the Bow Valley Trail but even if you decide to go full steam ahead without stopping, you are in for a treat…mostly. Snow capped mountains stalk your eyes as tall tree packed woods whizz by. Some of the worlds rarest and most beautiful animals call these woods their home and those lucky enough may get a peek. I actually saw a wolf lounging back into the cover on the way. Though it is usually a standard 40 minutes or so drive between destinations, the speed limits are all over the place until 2011 as work is done to make it a 4 lane highway. The speed limit varies bewteen 30km/h to 100km/h so keep your eyes open. It will be worth it when its finished. With about 30km left on the trip and only the 5th time singing Queen songs, a freak (but fairly normal) Canadian Rockies snowstorm hit out of the blue. Within minutes, the black road became white, the mountains disappeared and cars pulled over or slowed down to an early morning snails pace. From blue sky to the feeling that you just got wrapped up in an envelope in mere moments, you have to love the Rockies! So, road trip one of the Canadian Rockies was successfully completed. Tea in the warmth of the Fairmont Chateaux was enjoyed and the pink station wagon was punished out in the snowy carpark. Maybe making it to your destination alive is the one rule of what makes a road trip. With Lake Louise ticked off the list, Jasper is calling out. I really need to learn some new songs!